Born at just 23 weeks gestation, Devika Walia was the only surviving triplet in her family. Her grandmother holds her here after a 5-month battle for life in Akron Children’s Neonatal Intensive Care Unit (NICU) in 1999. When Devika Walia was born at Wooster Community Hospital on Oct. 1, 1999, at 23 weeks gestation, she weighed a mere 1 pound, 6 oz. – her premature birth made all the more harrowing because her mother delivered 3 babies that day. Doctors told the triplets’ parents they likely only had hours to live. Although both her brother and sister passed away within weeks of birth, Devika kept defying the odds. Requiring multiple surgeries as well as feeding tubes and a central line, Devika was discharged home after a 5-month stay in the Akron Children’s Neonatal Intensive Care Unit (NICU). 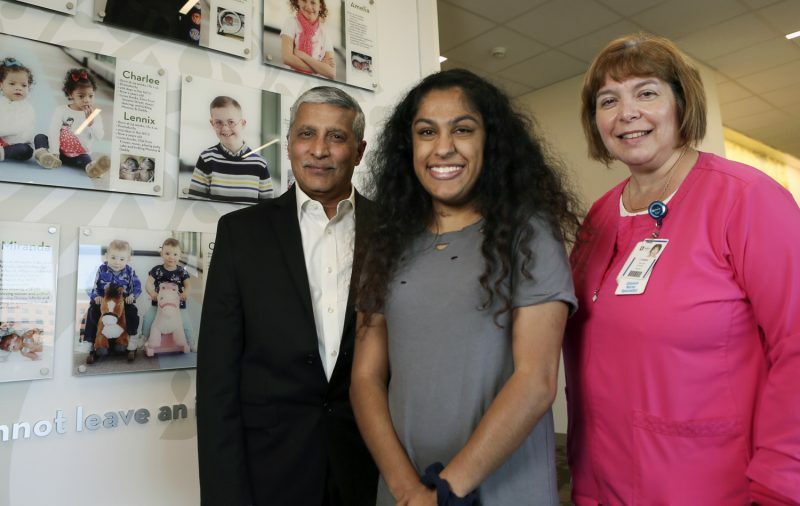 Now 19 years old and a freshman at Cleveland State University, she is thriving – crediting both her family and the care she received at Akron Children’s with helping her lead a normal life. For Neonatology Director Dr. Anand Kantak, who also happened to be Devika’s neonatologist, her progress is not only heartwarming, but a testament to the care she received almost 2 decades ago. “To be born at 23 weeks is certainly at the edge of viability, but the odds were even worse because of being carried in the womb along with 2 siblings and being born a long distance away from a NICU facility,” he said. Following discharge from the NICU, the Walias remained close with Dr. Kantak. Each year they return to the hospital around Devika’s birthday to bring food and treats to the NICU and Ronald McDonald House of Akron staff to express their gratitude for the care and hospitality shown to them. Devika Walia, 19, with Dr. Anand Kantak (left) and Clinical Nurse Specialist Connie Teal (right). Both cared for her 2 decades ago. “Since Devika’s survival was made possible by the NICU’s continuous improvement in quality of care, I wanted her to get involved in our project to improve small baby outcomes,” said Dr. Kantak. 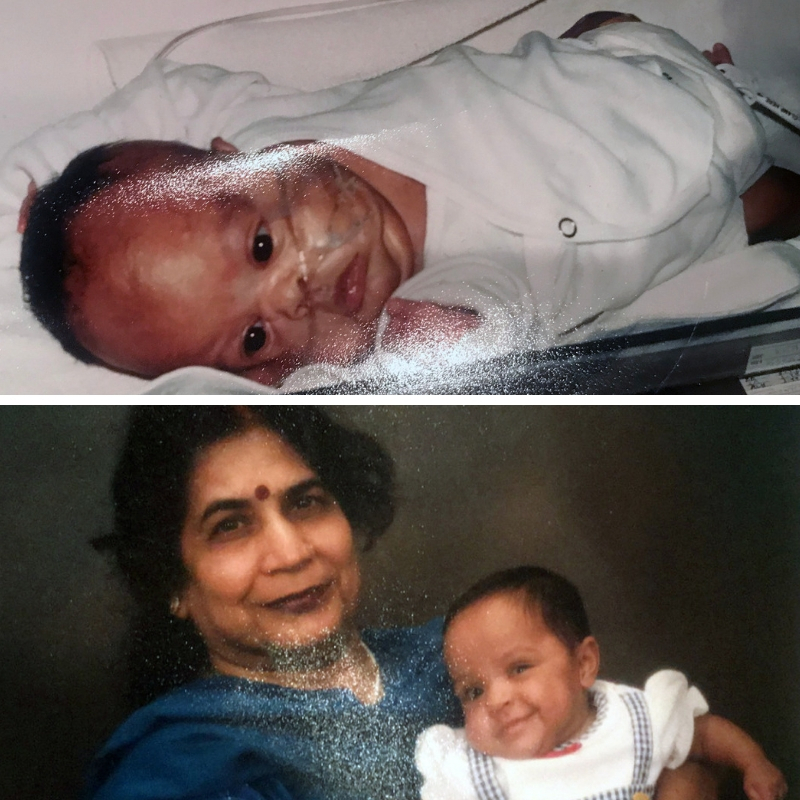 In a twist of fate, Clinical Nurse Specialist Connie Teal, who served as Devika’s case manager in 1999, was working on a project on the NICU’s small baby unit for a presentation at the Vermont Oxford Network (VON) Quality Congress. Devika was assigned to help Connie with data summary and analysis. Connie says VON is a neonatal quality healthcare collaborative in which multiple high-functioning NICU teams work together as an interdisciplinary community to share research and best practices. In 2017, Connie, together with the neonatology team, created a steering committee as well as 13 different multidisciplinary subcommittees to address everything from pain and sedation to infection control and skin care in babies 22-29 weeks. Each committee looked at the evidence for their area and developed guidelines for patient care before the small baby unit went live on April 2. One of the new procedures the NICU adopted for the small baby unit was hands-on care every 6 hours, instead of every 4. Connie says the NICU is working to keep the same clinical teams caring for the same babies to maintain continuity. “It helps the clinicians get to know the baby better and it also allows for a more family-centered care approach,” she said. All clinical personnel who work in the NICU are now required to complete 4 mandatory education modules on how to care for the unit’s tiniest patients. Since the unit opened, Connie says they’ve cared for approximately 40 babies who are also enrolled in the project – allowing the NICU to follow the babies in hopes of improving outcomes. “We collect data that looks at morbidities that commonly affect preemies like retinopathy of prematurity, brain bleeds and chronic lung disease,” said Connie. Much of the data Connie had been collecting needed to be summarized and that’s where Devika came in. Devika traveled with the Akron Children’s contingent to the VON conference in Chicago, spoke to a national audience and answered their questions at the poster fair. 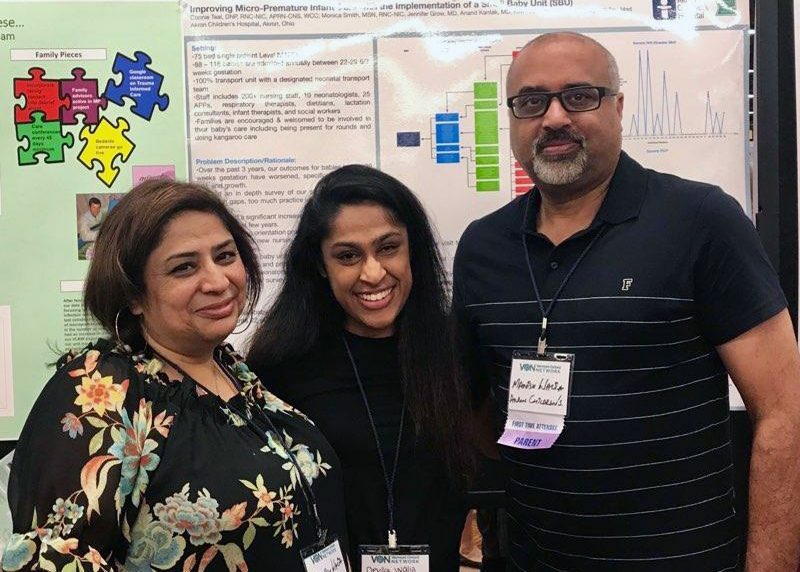 Devika proudly stands with her parents, Manesh and Rachna Walia, in front of the research poster in Chicago. Devika, who also helped put together manuals during her summer internship, looks forward to coming back on school breaks and staying involved.